As of 11 am, the center of Hurricane Florence is located approximately 120 miles due southeast of Emerald Isle. The Category 2 storm currently has maximum winds of 105 mph and is moving northwest at 10 mph. Winds in Emerald Isle are currently highly variable, however, a gust of 63 mph was recorded at Fire Station 2 not long ago. The first rain bands have come ashore, and Emerald Isle has already received anywhere from 0.6 inches to 1.6 inches, depending on location. Florence is currently forecast to make landfall near Wrightsville Beach tomorrow morning around 7 am with winds of 105 mph, which means Emerald Isle would be in the most dangerous northeast quadrant. 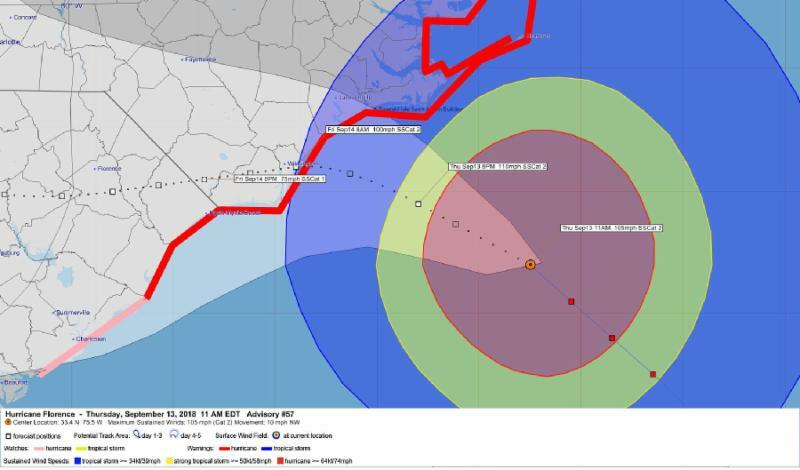 The eye of Florence is currently forecast to pass approximately 40 miles due south of Emerald Isle at approximately midnight tonight. Tropical storm force winds are currently occurring in Emerald Isle, and are expected to continue into early Saturday morning. Hurricane force winds are expected to begin in Emerald Isle around 7 pm this evening, and continue into late Friday morning. Significant wind, storm surge, and rainfall are expected in Emerald Isle, and the initial rain bands are closing in on Emerald Isle. Hurricane force winds, storm surge of up to 13 feet, and rainfall totals up to 30 inches are forecast, and specific impacts will depend on exactly where Florence makes landfall, where it goes after, and how fast it moves. Emerald Isle is under a MANDATORY EVACUATION ORDER, and everyone should have already left Emerald Isle or should be sheltered in place. Due to the significant danger posed by Florence, Emerald Isle is under a curfew, and the Emerald Isle bridge is closed. No one will be allowed to enter Emerald Isle until further notice. The curfew will remain in effect for the duration of Hurricane Florence, until further notice. During the curfew, it is illegal for anyone to leave their own property and travel anywhere within Emerald Isle. 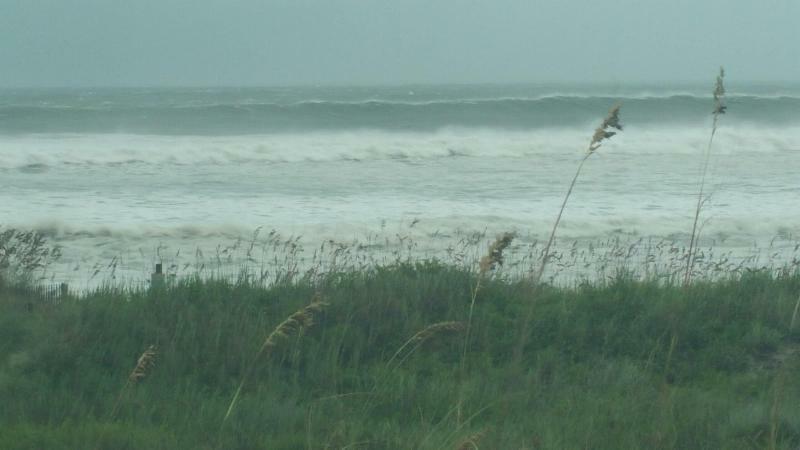 After the storm ends, Town officials will assess the conditions in Emerald Isle and make decisions based on public safety. Due to the fact that Florence is expected to stall somewhat, and the projected significant impacts on Emerald Isle on both Thursday and Friday, it is possible that the bridge will be closed for multiple days, and perhaps longer depending on the impacts on the ground.